For some reason I always feel the need to make at least one cookie recipe for big family events. In the case of Christmas I usually make two. Is there a need for two? Probably not, but there is something spectacular about seeing stacks and stacks of cookies lined up awaiting the next day's celebration. Sure a cake or two is impressive, but when you can build a city skyline of cookies it really is something special. I'm not the biggest fan of sugar cookies, but my brother (the one that never gets mentioned) loves them. I think they might be his favourite overall, or at least a close second to oatmeal raisin. I have had this recipe bookmarked for quite some time, but have always avoided using it because of its “secret ingredient:” Jello vanilla instant pudding mix. For some reason as a baking snob I'm somewhat inclined to turn my nose up at any recipe that uses boxed ingredients. However, in this case, I'm very glad I was able to put my prejudice aside. 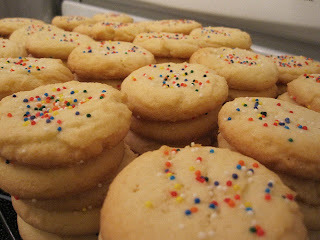 I'm not exaggerating in the least when I say that these are simply the best sugar cookies I have ever had in my life. I think everyone who has had them has also agreed with me. I didn't touch the recipe at all, and they turned out perfect. The most amazing thing about these cookies is that they crumble in your mouth like shortbread, giving you the best of both worlds. The light, sweet flavour of a sugar cookie coupled with the wonderful crumbly texture of shortbread. As I was buying ingredients for this recipe I miscalculated how much pudding mix I would need and accidentally bought three boxes. Before making and tasting these cookies I was pretty much set on returning the two extras (I realize it's only a few dollars :) ). But now that I've tried them, I can't wait to make them again, and I think I will always keep some pudding mix on hand just in case I have a craving. Be warned though, this recipe makes a huge batch, I made approximately nine dozen cookies with one recipe. If you have no one to share these cookies with, I suggest in the same trip you go out to get the pudding mix, you also pick up a new pair of pants, preferably one size larger than your current ones. Yes, they're just that good :). Preheat oven to 350F and grease cookie sheets. In a medium bowl add flour, cream of tartar and baking soda. Whisk to combine. In the large bowl of a mixer cream together butter, oil, sugar and powdered sugar until fluffy. Add eggs one at a time until combined. Add vanilla, salt, and pudding mix and beat until completely combined. Reduce mixer speed to low and slowly add dry ingredients to wet, scraping down the bowl as necessary. Continue to mix until dry ingredients are completely incorporated. Drop by rounded teaspoons onto cookie sheets (I used my small cookie scoop). 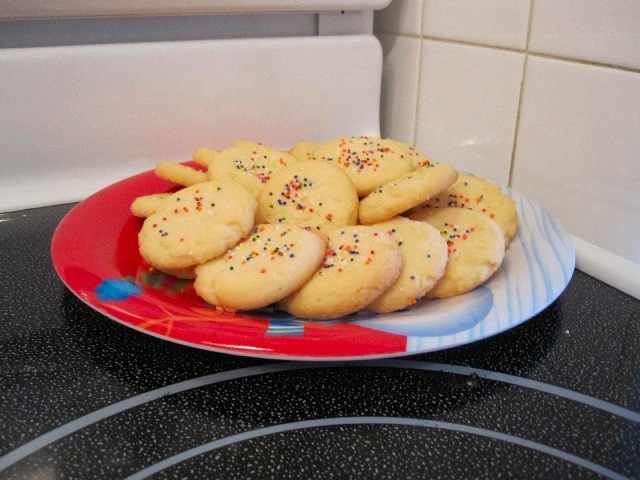 Using a spoon, gently flatten out the cookies a bit and add sprinkles to the tops. Bake for 12 to 15 minutes, or until cookies are just browned on the edges (mine took exactly 12 minutes). Allow to cool on baking sheet for 2 to 3 minute before moving to rack to cool completely. Like an Implosion of soft crunch!